In 90 Minutes in Heaven, Don Piper has written a book about how he died and went to Heaven for 90 minutes and his journey to healing. Don Piper is a pastor and he was headed to a conference hosted by The Baptist General Convention of Texas in 1989. The conference was located in the north shore of Lake Livingstone at a place called Trinity Pines. When he was headed back home, it started raining and he had to cross a highway that had no shoulders and a bridge. When he was on the bridge at around 11:45 a.m., his car was hit head on by an eighteen wheeler driven by an inmate who didn’t have the license to drive that kind of vehicle. The driver of the eighteen wheeler also hit two more cars and the drivers in the other vehicles was fine. Don Piper was declared dead on the scene and this is where his trip to Heaven occurred and he describes in details his experience. I would recommend this awesome book to anyone who enjoys reading about people’s experiences with seeing Heaven and living to describe what they saw. This is the first time, I have read Don Piper’s book and heard his story. The things he saw in Heaven was very eye-opening and it gave me much hope about the magnificent place I’m going someday. I also like how in the last chapter, it contained stories about how Don’s story has changed their lives. This stories were very inspiring to read. Reading the book as also made me want to see the movie when it comes out. I was lucky enough to be able to watch the first few minutes of the movie by participating in this book tour. While watching the first few minutes, I also realized that they filmed the accident scene on a bridge in Gainesville, GA on Lake Lanier and I have drove across this bridge many times. I’m also excited to see this film because it stars, Hayden Christensen from Star Wars and Christian Recording Artist, Michael W. Smith. Starring Hayden Christensen (Star Wars: Episode II - Attack of the Clones, Star Wars: Episode III - Revenge of the Sith), Kate Bosworth (Remember The Titans, Blue Crush) Michael W. Smith, Fred Thompson, Dwight Yoakam, and Jason Kennedy, 90 Minutes In Heaven is based on the inspiring New York Times best-selling book that has sold 7 million copies. Giving Films is passionate about sharing hope-filled movies and donating ALL of their profits to charities and ministries who serve those in need. 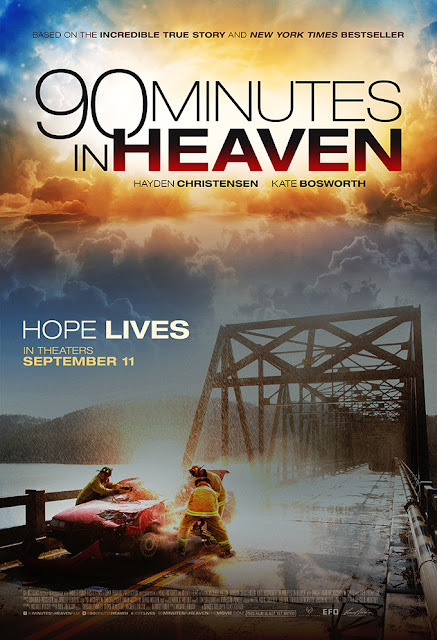 Beginning with their first film, 90 Minutes In Heaven, Giving Films is allowing all of us to be a part of making a difference. Anytime you go to a Giving Films movie in theaters, visit http://www.givingfilms.com and select which charities you want to receive the profits from your ticket. Their charitable organizations are Christian Alliance for Orphans, Faith Bridge Foster Care, Hire Heroes USA, Hope International, LifeWater, Street Grace, and World Vision. Pastor Don Piper died January 18, 1989 when a semi-tractor truck crushed his car. Declared dead by the first rescue workers to arrive on the scene, Don's body lay under a tarp for the next 90 minutes. Don's soul, meanwhile, was experiencing love, joy, and life like he'd never known before. Don was in Heaven. When another pastor's prayers helped bring Don back to life, he became a living miracle! Yet this is one miracle Don wished never happened. Heaven's bliss was replaced by excruciating pain and emotional turmoil. With the support and prayers of his beloved Eva, their three kids, and friends near and far, Don clings to his faith in God and fights to regain a semblance of his previous life. The Piper family's incredible true story of perseverance and overcoming the challenges of life - and death - will bring hope and encouragement to all who see it.